It’s easier than you think with the Control Coffee Intake Hypnosis MP3. Steve G. Jones, Ed.D., Clinical Hypnotherapist, charges $1,500 for a custom recording and $25,000 for a one-hour private hypnotherapy session at his office, but you can get all the benefits for this low price. Simply listen to the Control Coffee Intake Hypnosis MP3 session every night as you go to bed for three weeks and feel the changes happening in your life. You will feel more empowered, more in touch with your true self, and you will truly know that your goals are within your reach. Steve G. Jones achieves AMAZING and LASTING results!!! Hypnosis is the easiest way to affect change in your life because the positive messages go straight to your subconscious mind effortlessly so you can accomplish your goals and reach for the stars!! All you have to do is listen to the Control Coffee Intake Hypnosis MP3 download at night as you go to sleep!!! You’ll hear soft music, the gentle sounds of the beach, and the soothing sound of Steve G. Jones’ voice all working together to bring about positive changes in your life easily and naturally. Steve G. Jones has been helping people improve their lives with hypnosis for over 20 years…now it’s time for him to help YOU… don’t wait, do it NOW !!! you’ll be glad you did. See you at the top! You are feeling even more relaxed. Think about how much coffee you consume. Picture yourself in your normal routine of drinking coffee. Maybe you have a favorite mug, you get out any mug you like. You go through your routine of pouring your coffee into your cup and possibly adding sugar or cream. Notice the feeling you get as you get toward the bottom of your cup. You feel like you need more coffee and want more coffee. You love the taste and the warmth as it goes down your throat. You think that the caffeine in the coffee is the only thing keeping you awake. Now, erase this routine from your head. Erase the feeling of needing and wanting more coffee, go ahead and get rid of the urge. You no longer need several cups of coffee. You know you don’t really want or need to consume a lot of coffee everyday. One cup a day is just fine. You get the same amount of pleasure from one cup as you did from two, or three, or ten cups of coffee. Now picture yourself in your normal coffee drinking routine. You do not have as much coffee in the pot. You pour the liquid into your special mug. You add cream or sugar if you like it, or maybe you drink it black, whatever you add to your coffee, you enjoy preparing your cup. You wrap your hands around the cup. It feels warm to the touch. It’s at the perfect temperature. You breath the aromatic flavor through your nose. It smells delicious and inviting. You then taste your coffee. It’s the perfect cup of coffee; it’s exactly how you wanted it to taste. You very slowly drink your coffee and savor every sip. All of your attention is on your enjoyment of this one cup of coffee. Every sip satisfies you. You get toward the end of the cup and you do not think about wanting a refill. You think about how great that tasted and how it has enough caffeine to get you through the day. As you take your last sip, you notice how you feel completely satisfied with the cup of coffee you just had. You thoroughly enjoyed every single sip. You go on about your day as normal. You are full of energy and ready to take on your day. You are not tempted by having more coffee you are alert, and you are completely satisfied by one cup. One of the many reasons why people decide to reduce the amount of coffee they drink is the caffeine. Drinking a lot of caffeine can have negative effects on the body, including messing up our sleep cycle. It can also cause irritability, headaches, anxiety, and abnormal heart rhythms if too much is ingested. If you want to cut down and control your coffee intake, then you have come to the right place. Hypnotherapy will help you learn reduce your coffee consumption and keep you energized without depending on caffeine. According to the Mayo Clinic, a normal amount of caffeine is 200-300mg. This is equivalent to two or three cups of coffee a day. 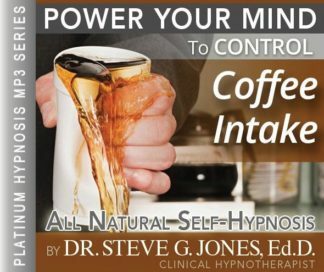 No matter how much coffee you currently drink every day, the Control Coffee Intake Hypnosis MP3 recording is for you! This powerful hypnosis program can help you completely eliminate your consumption of coffee or it can help you drastically reduce the number of cups you drink. Hypnotherapy targets your subconscious mind so that you can cut down on the number of cups of coffee you drink every day. We suggest that you listen to the hypnosis session on MP3 for 21 nights in a row before bedtime. During these 21 days, your subconscious mind will tell your conscious mind that you have had enough after one or two cups of coffee. Hypnosis is a very powerful tool to help rid yourself of your coffee habit! No matter what your reason is for reducing your coffee intake, hypnotherapy will help. Hypnosis gives you the power you need to no longer depend on coffee.